Home » Blog » Mermaids DO Exist! The mermaids had been in trouble. For thirty years, they had been rising up from the ocean to flaunt their glittering scales and seashells, leaving a trail of seaspray and seaweed across the hearts of hundreds of thousands of onlookers at the annual Coney Island Mermaid Parade. 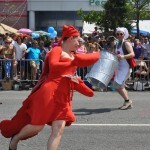 But this past year the mermaids’ resources were threatened by Hurricane Sandy: the parade gets most of its funding from its museum, sideshows and gift shop, which were destroyed in the storm. Would they be able to have the parade at all? Luckily, a very successful Kickstarter campaign and numerous sponsorships saved the mermaids. The parade not only met its $100,000 goal but exceeded it by almost $18,000. And on June 22, all 1500 or so mermaids, mermen, sea creatures, and more made their way down Surf Avenue. Started in 1983 as a celebration of art, self-expression, and self-esteem, the Mermaid Parade is an Americanized summer solstice celebration and now not just a Brooklyn tradition, but one that spans the five boroughs. It is also the world’s largest art parade. Coney Island itself has always been an epicenter for enthusiastic sideshow culture—loving the “freaks and geeks” as it were that made Coney Island what it is and what it continues to be. In 2012, as many as 750,000 people made way for mermaids, but this year the crowds were expected to be even larger. Exiting the Coney Island stop on the D train, I realized it was more crowded than even Grand Central Station at rush hour. People flooded out onto Surf Avenue to take their places behind the police barriers, some in costumes constructed so meticulously I don’t know how the even made it on the subway. One man in drag wore a dress made to resemble an entire coral reef, another was buried inside the mouth of a giant silver fish costume. I fought my way past herds of people, at one point literally paused in line in the middle of the sidewalk trying to get by. Eventually, I wedged my way to the front of a barricade, a prime picture-taking spot. A r owdy but good-natured crowd stood around me, some who had pretty much set up camp for themselves with beach chairs, coolers, and umbrellas. “The Mermaid Parade is on its way!” Brooklyn borough president Marty Markowitz yelled through a megaphone from his float. “Nothing can stop Brooklyn! We’re back and better than ever!” It seems nothing can keep the mermaids down, not hurricanes or lack of resources. At this point the parade is so well-loved there’s little I imagine that could stop it. The parade’s Grand Marshals (King Neptune and Queen Mermaid) this year were actor/comedian Judah Friedlander and author Carole Radziwill. In addition to Friedlander and Radziwill, people of all ages, sexes, shapes, and sizes got done up in their personal take on mermaid gear. The parade is separated into different categories, one for families, one that’s adults only (because the costumes can get…risqué), one for Broadway shows with a mermaid parade twist (The Book of Mermen, Wet Side Story), and many others. I saw lady lobsters being chased around by chefs with silver pots; a mermaid whose tail, bikini, and swimming cap were made entirely of Duck Tape; mermen in painted green from head to toe, covered only by strategically placed gold trim; mothers and children wearing matching homemade, sparkling mermaid tails. I would say the sky was the limit, but there were mermaids on stilts, too! 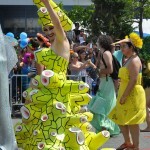 Though I don’t think I personally could participate in the Mermaid Parade (I don’t know if I have the guts! ), it was a delight to watch and photograph. And, of course, when it’s all over, to wait in line and get a Nathan’s Famous hot dog, in true Coney Island fashion. The woman next to me impatiently tapped her fins as we waited, the starfish in her hair shaking slightly. It was worth the wait.